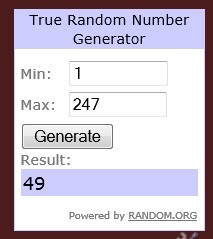 Sorry for the delay in drawing a winner. No internet connections! I've made quite a few potato recipes but still had not done the hashbrown by myself. I finally got a chance to do hashbrown this week for breakfast with some help from Hungry Jack! I always make breakfast for our family, so it's great to try out new ideas or additions to our breakfast menu. It was pretty tasty and the kids loved it! This makes me want to add some more ingredients and try different recipes with the hash browns.. The instructions were easy to follow. I would have taken much longer to get this done. Getting my potatoes, washing, peeling, shredding, seasoning and then cooking them, is a much longer process. And I admit, I don't mind doing it the long way, but I would still need a recipe to go from, so I'm glad I got to try the Hungry Jack Premium hashbrown Potatoes. Let stand: close carton and let stand for 12 minutes. Drain well. Pan fry on one side for 3-4 minutes, or until golden brown. I made my breakfast with the hashbrown, eggs and bread melted with cheese. Yum! Made from 100 percent Idaho® potatoes, Hungry Jack® Premium Hashbrown Potatoes come fully cooked and seasoned and require no refrigeration. In just four easy steps, you can prepare tasty, restaurant-quality hashbrowns in approximately 15 minutes. With the time saved, you can even sit down with your family to enjoy a special, home-cooked breakfast. I am giving away TWO Hungry Jack Premium Hashbrown Potatoes prize pack. For more chances to win from Hungry Jack, you can enter their My Happy Hungry Jack Family Photo Contest. Between now and July 31st, you can enter for a chance to win a $3,000 kitchen shopping spree. All you have to do is simply upload a photo of you and your family enjoying Hungry Jack Premium Hashbrown Potatoes with a brief caption of how you enjoy your hashbrown potatoes. The photo and caption can be anything from eating hashbrown potatoes for “brinner” (breakfast for dinner) with your family, as an outdoor meal while out on a camping trip or as a snack while your kids are doing their homework – whatever you upload and write is up to your imagination! Do you make your own hashbrown or prefer to wait until you eat out to order them? This was not a paid post. I received the Hungry Jack kit above to facilitate this review and giveaway. Facebook is in no way associated or responsible for this feature or giveaway. See my disclosure. Both! I love hash browns all the time! Ive never made hashbrowns before, I only get them when Im out eating. I don't make them much anymore, but I use to make them several times a week. We typically make them at home ... eating out is expensive and one never knows exactly what they are getting. Eating at home is healthier. Thanks for this opportunity! #1 - I'm following your blog via google friend connect. #2 - I'm following your blog via google friend connect. I like everything better when someone else cooks! I usually don't make hash browns, but I love to order them when we're out. My hubby has made homemade hash browns once in a while, but they seem like so much work! i order them when we go out to eat. I like hungry jack on fb. I've tried making my own hashbrowns from scratch and it was a disaster. I definitely order mine when we're ordering out.